S1631 sighted lurking around S fuel bay. Has anyone got info on the new bus 1631 - it is currently listed as in the workshops. 1595 is now at Eagle Farm. Doing driver training still in downtown loop livery. Will be staying in loop livery. Some fleet movements look to be on the way - have seen V2212 and V2214 on Eagle Farm routes over the past couple of days. Queensland's new trains struggling to cope with summer heat 15 January 2018. •Airconditioning was a problem identified in Queensland's new trains last March. •The new trains have been collecting passengers for one month. •Passengers say the poor airconditioning leaves carriages feeling hot and humid. Rail commuters have complained the airconditioning in south-east Queensland’s new trains is not coping with hot, steamy summer temperatures. Months after problems with the airconditioning on the Indian-built trains was identified, commuters have been leaving posts on the Facebook page of public transport advocacy group Rail Back on Track, prompting a response from TransLink. Doubts about the airconditioning in Queensland's new trains are re-emerging. Photo: Supplied. The New Generation Rollingstock trains began to collect passengers last month. Rail Back on Track's Robert Dow said the passenger carriages on the 23 NGR trains now in south-east Queensland were stuffy and humid. Five of those trains have been approved and are running on the CityTrain network. “We have been getting some feedback and complaints for quite a while,” Mr Dow said. “People are saying that it is just hot and humid inside the new trains. It has come up enough times now and for long enough for us to think this could be a bad problem. Damian Jones posted on Rail Back on Track's website that the airconditioning in the new trains could not handle Queensland’s heat. “Another air-con system from overseas that can't handle Queensland’s humidity and high temperatures,” he posted. Another commuter, Imran Isawi, agreed. “Why can’t QR have decent, reliable (airconditioning) when other states can?" he asked. “Sydney’s trains put ours to shame. Queensland is sub-tropical, mostly warm to hot and frequently humid. Proper air-con is just a basic necessity on public transport. Others said the airconditioning temperatures in the new trains varied between carriages. A TransLink spokesman confirmed a trial to improve airconditioning on the new trains had started. "The New Generation Rollingstock project team has taken note of feedback from some customers regarding the temperature of the airconditioning system in the NGR trains, and is actively investigating the issue," he said. "A trial is under way which involves a slight lowering of the airconditioning temperature, which includes a detailed analysis of the temperature across the carriages to ensure customer comfort. "Early feedback from this trial has been positive. If this adjustment to the temperature resolves the issue, it will be made on all NGR trains in passenger service by the end of this week." The TransLink spokesman said the airconditioning issue was not stopping the new trains from being added to service. "This issue is not a fault with the units and is not affecting the introduction of new trains into service," he said. Queensland Rail hopes to have between 10 and 15 new trains in place by the Commonwealth Games in April. Overall, 75 new trains have been ordered. Problems with the airconditioning on the Indian-built trains was one issue identified in March 2017, when delivery of the new trains was halted. Mr Dow said the airconditioning in the new trains contrasted with the rest of the trains in south-east Queensland’s train fleet, nicknamed EMUs, which stands for electrical multiple units. “The EMUs, which the NGR trains are destined to replace, have, in our opinion, the best airconditioning of the entire train fleet,” Mr Dow posted. One comment suggested airconditioning problems were delaying QR’s formal acceptance of the NGR trains. This was denied by Queensland Rail’s TransLink. Mr Dow said he travelled on one of the new trains to test the airconditioning after hearing complaints. “It seems to be variable,” he said. Maximum south-east Queensland temperatures were above 30 degrees last week, with Brisbane topping 37 degrees on Sunday. Brisbane’s maximum temperatures are this week were predicted to be between 30 and 32 degrees. * I'm sure the LNP will stay quiet about this one because the orders were made for the trains on their watch as I recall. Because BT have a long-term exclusive contract with Volvo. Besides, having travelled on both as a passenger, I know which I'd prefer! TransLink app derails as hundreds of frustrated users create flood of one-star reviews. 21 January 2018 Brisbane Times. The TransLink app has well and truly gone off the rails in the past month, after an update caused hundreds of users to abandon the app and the software's rating on Google Play to plummet. Complaints about MyTransLink focus on the poor usability of the software, with issues including the app itself crashing regularly, the app causing phones to crash, users struggling to enter their search criteria and customers losing their list of favourite destinations. Frustrated customers are calling for the previous version to be reinstated and abandoning the app. Photo: Tammy Law - Fairfax Media. The message from customers is simple: go back to the previous version and abandon what they describe as "useless", "terrible" and "absolute rubbish" software. According to Google Play, the Android version of the app was last updated on December 12 and the App Store indicates the iPhone version was last updated on December 20. Almost 700 one-star reviews have been written on Google Play, with fresh posts coming in on a daily basis. The Android app has an average rating of 2.6 stars out of five and 42 per cent of the total reviews have been one-star. “Update was absolutely terrible. It removed all my favourite stops and services ... Journey planner is absolutely horrid too, gives you the most long-winded trips. The user interface is super user unfriendly. Please stop making it pretty, make it work,” Christine Chang wrote on January 12. “This app is now absolute rubbish. I am so sick of trying to use the ‘leave before’ or ‘leave after’ functions which result in no results except for being memorized (sic) by the spinning circle which goes on indefinitely," Alan Wade posted on January 7. According to Google Play and the App Store, the MyTransLink app was last updated in early to mid-December. Photo: Supplied. "Sorry TransLink but I’m done with this app. It is one of the least intuitive apps I’ve ever used. With every update it gets harder to navigate and less useful. That is if it works at all and doesn’t fail to load and hang or just outright crash ... Uninstalled and going back to the website via (the) browser," Tim Howlett said on January 6. “Please, please, please give us back the old app. I just tried to find a simple timetable to leave tomorrow morning. Rather than give me the order of stops to choose from, I’m given a list of addresses in alphabetical order. If I’m new to this area would I know these addresses?” Kylie Flack published on January 3. “The app told me it was a two-minute walk from Annerley to Fortitude Valley Station .... whilst your website Journey Planner said the correct time of about 43 minutes combining walking and busing,” Benjamin Caulfield said on January 3. “I’ve had to remove the app from my phone because I kept getting messages that this app was slowing my phone down because it has crashed 10 times in the last week," Michael Stephens posted on January 2. MyTransLink has an even worse rating on the App Store with only 1.7 stars out of five, but there have only been 47 reviews posted. In response to the criticism, a TransLink spokesperson said further updates would be made available to fix existing problems and that numerous app features had been well-received. "We’re aware of concerns from a number of customers about our recent update to the MyTransLink app," the spokesperson said. "We are listening to feedback through social media, our website, App Store and Play Store and through the TransLink call centre and will continue to rollout changes to improve app functionality and address key issues. "These updates can take time to test and implement properly and we appreciate customers’ patience through this process. "A number of elements of the app have received positive feedback, including new features such as an interactive map and vehicle tracking. "We encourage our customers to continue to submit detailed feedback on any issues you have with the app so we can make travelling on public transport easier than ever." Just last week, a technical issue with TransLink’s website and mobile app prevented users from seeing whether their buses were running on time during peak hour. Speaking as one interested in passenger amenity and efficiency, unlike Scania with their N series, Volvo aren't heading anywhere good unless they make their B5L low floor chassis more widely available (i.e. not just as a hybrid). Maroon cityglider is now extended to holdsworth street. 1631 Volvo B8 articulated is at Sherwood being photographed. Has Eagle Farm taken over both downtown loops (40 & 50). Noted E optimus' operating both loops today according to realtime data. These are simply articulated buses. What's the big fuss about? They complain that it has more standing capacity than a rigid bus while ignoring the fact that it also has much more seating capacity. Dotty. Why the decision not to have all-door loading? That's a no-brainer. How come Brisbane Transport withdrew all Mercedes Benz O500LE buses (numbered 351-622) before the scanias? All Brisbane train lines closed for weekend track work, hour-long delays expected 16 February 2018. South-east Queensland train users can expect hour-long delays this weekend, with track work closing inner-city stations and forcing buses to ferry passengers around the maintenance areas. From the first Saturday service to the last Sunday service, all train lines through the Brisbane CBD will be cut, before normal services resume first thing Monday. Public transport users have been warned to allow an extra hour for the transfer from trains to rail replacement buses. The maintenance work will be carried out at Fortitude Valley, Newmarket, Wilston and Windsor. There will also be re-railing from Bowen Hills to Windsor and Newmarket to Alderley. Caboolture, Sunshine Coast, and Shorncliffe services will end at Albion, with passengers hoping to travel into the city or beyond needing to transfer onto a replacement bus. Meanwhile, the Redcliffe Peninsula, Ferny Grove and Airport lines will be cut at Bowen Hills, where buses will be waiting. The Ipswich/Rosewood and Springfield line will stop at Corinda for bus transfers. Elsewhere, the Beenleigh and Gold Coast trains will end at Yeerongpilly, where replacement buses will be waiting. Cleveland line trains will terminate at Murarrie for bus transfers. Doomben services trains will stop at Wooloowin, where passengers will wait to catch the next city-bound Shorncliffe or Airport line train to Albion, to then board an inbound rail replacement bus. Queensland Rail chief executive Nick Easy said the track work was scheduled 12 months in advance and was part of the preparation work ahead of the Gold Coast 2018 Commonwealth Games. "We have undertaken a comprehensive suite of maintenance and upgrade works to ready our network in lead up to the Games, and have also carefully scheduled our routine maintenance requirements to not affect the network during the games period," he said. "As part of this comprehensive maintenance program, last weekend, Queensland Rail completed more than 7000 hours of required maintenance work on the Gold Coast line between Park Road and Varsity Lakes stations. "Queensland Rail will continue to undertake preventative and corrective maintenance work across the city network in lead up to the Commonwealth Games and as part of business as usual maintenance activities. "(This includes) major weekend work in the inner city area this weekend (from Bowen Hills to Corinda, Murarrie and Yeerongpilly) .... and again on the Gold Coast line from Park Road to Varsity Lakes stations on March 10-11, 2018. "During these works, buses will operate in place of trains, to provide a continued connection for our customers." 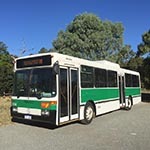 bwelch wrote: How come Brisbane Transport withdrew all Mercedes Benz O500LE buses (numbered 351-622) before the scanias? Does anyone know how long the B7 contract will be going for? There has been a Gas Leak at the Toowong Bus Depot. FROM 11AM: MAJOR GAS LEAK at Toowong Bus Depot. Authorities alerted at 10:45am. Miskin Street closed off. 300 workers evacuated, 100 buses diverted to other depots. T1010 at Oxley being towed. Today is "6years of Service" for Volvo B7RLE/Volgrens S1966,S1967,S1968. BCC Leyland Panther # 383 went into Service for the Brisbane City Council Department of Transport on this Day 03/04/1968.